NASA's decision to buy an inflatable new room for the International Space Station may push the module's builder —commercial spaceflight company Bigelow Aerospace — one step closer to establishing its own private stations in orbit. Last week, NASA announced that it will pay $17.8 million for the Nevada-based company's Bigelow Expandable Activity Module (BEAM), which will be affixed to the huge orbiting lab as a technology demonstration. NASA and Bigelow will discuss the deal during a media event Wednesday (Jan. 16) in North Las Vegas, where the company is headquartered. BEAM could help prove out the viability of inflatable crew habitats, potentially jump-starting Bigelow's ambitious plans in low-Earth orbit and, perhaps, on the surface of the moon. Bigelow Aerospace specializes in expandable habitats, which launch in a compact form and then inflate upon reaching space. The company says expandable modules offer greater on-orbit volume and better protection against radiation and micrometeoroid strikes than traditional "tin can" designs can provide. Inflatable modules were first pursued seriously by NASA, which developed a design called TransHab (short for "Transit Habitat") for possible use on the International Space Station. When Congress cancelled the TransHab program in 2000, Bigelow officials licensed the patents and began adapting the technology for the company's own purposes. The company's goals are big: to establish private space stations that could be used by many different clients for a variety of purposes, from research to tourism. "We are primarily focused on providing sovereign clients (individual or groups of nations) and companies with the opportunity to lease space and resources aboard our habitats for a broad array of activities, ranging from turn-key astronautics to conducting ground-breaking and lucrative biotech research," Bigelow Aerospace's website states. "We offer a way for countries to bolster their human spaceflight programs while at the same time reducing their budgets, or for smaller countries that thought human spaceflight was beyond their financial reach to enjoy capabilities that until now only the wealthiest nations have been able to sponsor." But Bigelow is developing a much larger module, called the BA-330 because it offers 330 cubic meters of usable internal volume. 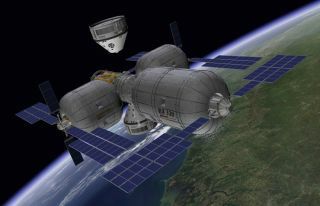 The company envisions linking up two or more BA-330s in orbit to create its first space stations, which have already attracted attention from potential clients. For example, Bigelow has signed memoranda of understanding with seven governments that wish to use the company's orbiting facilities — Australia, Singapore, the United Kingdom, the Netherlands, Japan, Sweden and Dubai, in the United Arab Emirates. Clients may have several different ways to reach Bigelow's habitats. The company has set up a partnership with the California-based firm SpaceX to use its Dragon spacecraft, and another with Boeing for use of its CST-100 capsule. Bigelow's dreams don't stop in low-Earth orbit. Robert Bigelow has voiced an interest in setting up outposts on the moon, which would employ BA-330 habitats that are joined together in space, flown down to the lunar surface and then covered with moon dirt to protect against radiation, temperature extremes and micrometeorite impacts. "Mr. Bigelow created Bigelow Aerospace with the express purpose of revolutionizing space commerce via the development of affordable, reliable and robust expandable space habitats," the company's website states.